The role of finance and financial actors in shaping the city is increasingly key to understanding some contemporary urban problems. Why are rents rising? Why is office space being built when we’re in the middle of a homelessness crisis and desperately need to increase the supply of affordable housing? How and where is profit being produced from urban space and what are the likely outcomes of this type of model? All of these questions in some way relate to how finance shapes the city. These questions have somewhat complex answers. Moreover, these are also quickly shifting sands. Indeed, the crisis (both in Ireland and internationally) and government responses to it has also created new opportunities for financial actors (Vulture funds, Real Estate Investment Trusts etc) to invest in and profit from the production of urban space. To understand the contemporary city requires us to understand the role that finance plays. In a previous blog post I looked at the concept of the ‘financialization of the city’. There were two key arguments put forward in that post. The first was that it is important to grasp precisely what is being financialized when we say the city is being financialized. It is the capacity of urban space, or rather property ownership over urban space, to generate ‘rent’ by capturing socially produced value. The issuing of credit and other financial products secured by or underpinned by income streams arising from property is ultimately underpinned by this singular monopolistic feature of ‘place as a commodity’, to use Molotch and Logan’s term. In my previous post and elsewhere (e.g. Byrne, 2016) I also but forward the above argument. However, there are problems with this approach that I’d like to address here briefly. The principal problem with the focus on real estate as a ‘tradable income yielding asset’ (Guironnet and Halber, 2014) is the fact that it is overly reliant on the US case and especially on the example of securitization. This is understandable given the role of securitization in the financial crisis. But it presents a particular problem for understanding the financialization of the city in the European context, where securitization played a relatively minor role. Understanding the role of property in the European financial system leads us in another direction. Here, the key driver of the property bubble was flows of finance between ‘core’ and ‘periphery’ (Flassbeck and Lapavitsas, 2015). This mainly took the form of inter-bank lending. Essentially, northern European banks invested in the over-heating property markets of Ireland and Spain (and elsewhere) by lending to banks in those countries. Securitization did play a role in Spain (López and Rodríguez, 2010; Norris and Byrne, 2015), but it was far from the main vehicle through which credit flowed into real estate. Nor was it the vehicle through which income streams arising from Irish residential and commercial real estate flowed bank into the international financial system. Most of the credit issued in Ireland during the property boom was non-securitized, more or less old fashioned development finance, investment loans and residential mortgages. The main driver was thus not financial innovation and the tradability of property as a financial asset, but economic and monetary union and the deregulation of financial flows, elimination of exchange rate risk and low ECB interest rates that accompanied it. If the transformation of real estate into a tradable income-yielding asset is not the definitive feature of financialization of the city then what is? Drawing on the Irish and Spanish cases, the key feature relates to the way in which income streams arising from local real estate took on a structural and systemic role in the European financial system and its expansion as well as in European political economy more generally. As has been argued by others (Hadjimichalis, 2011; Flassbeck and Lapavitsas, 2015; there also many parallels with David Harvey’s work on the built environment as the secondary circuit of capital here), investment in and returns from real estate canalized the flows of capital from the ‘current account surplus’ core countries to the ‘current account deficit’ peripheral countries. What is novel, then, is the systemic role of real estate in the circulation of interest bearing capital at a European level. The massive increase in the volume of credit flowing into real estate in Ireland and Spain reflects this role. From this point of view, securitization and inter-bank lending are two different mechanisms or avenues through which global financial capital can flow through local urban spaces, but not the cause or essential factor of the financialization of the city. Instead, the key factor is the structural and systemic role that income streams arising from property take on in the accumulation of capital at the European level. One concluding note which is interesting, however, is that the aftermath of the financial crisis has seen huge trading of financial assets linked to property in Ireland, Spain and across Europe. This has mainly taken the form of ‘bad banks’ and other ‘wind down operations’ selling distressed assets to US private equity and hedge funds (Byrne, 2015; 2016; forthcoming). This may mean the importance of property as a ‘tradable income yielding asset’ will grow in the aftermath of the crisis and the role of inter-banking landing and structural flows of capital between core and periphery may diminish. For the moment it is too early to draw any conclusion. Byrne, M. (2015). ‘Bad banks: the urban implications of Asset Management Companies’, Journal of Urban Research and Practice, 8(2) 255-266. Byrne, M. (2016a). ‘Asset price urbanism’ and financialization after the crisis: Ireland’s National Asset Management Agency. International Journal of Urban and Regional Research, 40(1), 31-45. Byrne, M. (Forthcoming) ‘Bad banks and the urban dimension of financialization: theorizing the co-constitutive relationship between finance and urban space’. City. Coakley, J. 1994. ‘The Integration of Property and Financial Markets’. Environment and Planning A 26 (5): 697–713. Flassbeck, H., & Lapavitsas, C. (2015). Against the troika: Crisis and austerity in the Eurozone. Verso Books. Gotham, K. F. 2006. The secondary circuit of capital reconsidered: globalization and the U.S. real estate sector. American Journal of Sociology 112(1): 231-75. Gotham, K.F. 2009. Creating Liquidity out of spatial fixity: the secondary circuit of capital and the subprime mortgage crisis. International Journal of Urban and Regional Research 33(2): 355-71. Hadjimichalis, C. (2011). Uneven geographical development and socio-spatial justice and solidarity: European regions after the 2009 financial crisis.European Urban and Regional Studies, 18(3), 254-274. López, I. and E, Rodríguez. 2010. Fin de ciclo: financiarización, territorio y socieded de propeitarios en la onda large del capitalismo hispano. Madrid, Traficantes de Sueños. Norris, M. and Byrne, M. 2015. Asset Price Keynesianism, Regional Imbalances and the Irish and Spanish Housing Booms and Busts. Built Environment, 41(2): 227-243. The purpose of the housing conference in Liberty Hall on Saturday 3rd October was to come together to work Towards a Real Housing Strategy. It was a structured forum for activists, academics and the wider public to engage with each other and bring together their own knowledges of the current housing question so that we can better understand it and discuss what should be done in order to address it. Activists from Housing Action Now, the North Dublin Bay Housing Crisis Committee, Inner City Helping Homeless, the Peter McVerry Trust, Right2Change, Mandate, Unite and a number of others, spoke and contributed to the discussion. The experiences and understandings of these groups and individuals added the required grounding to a crisis that can sometimes feel abstracted from the human cost of experiencing housing distress. As well as the ‘traditional’ activists, a number of academics from NUI Maynooth provided a framework allowing us to understand the current housing crisis within broader social, economic and political contexts. With these strands of understanding converging, there is the hope that a strategy for tackling the housing crisis can emerge. We have heard a lot about the crisis in Dublin’s rental sector in recent months. On the surface, a lack of properties for sale or to let on the market has contributed to rising rents and the crisis of homelessness. But underneath this, a less visible, though no less worrying, change has been taking place – the rise of the transnational landlord. Traditionally Irish landlords have been small-time amateurs. 65% of landlords have only one property with most others having just two or three. Many landlords work full time in addition to renting properties and up to one third are described as ‘accidental landlords’ – such as people renting out their own principal residence due to mortgage arrears. But recently a new breed of landlord has entered the scene, referred to as ‘professional’ or ‘institutional’ landlords. The most prominent is Ireland’s largest landlord, I.RES, a Real Estate Investment Trust focusing on long term investment in the rental sector. Other examples include global real estate companies such as Hines, Kennedy Wilson and Oxley Holdings, all of which are pursuing ‘build to rent’ strategies across Dublin. Like much of what’s going on in the Irish property market, this development is driven by three interacting sets of dynamics. Firstly, Irish property is being sold en masse at bargain basement prices . The sellers are financial institutions seeking to deleverage rapidly. These include foreign lenders such as Lloyds who sold their mortgage book to private equity firm Lone Star Capital. But the main players have been the Irish bad banks – Anglo and especially NAMA. Indeed 800 of the 1,200 apartments owned by I.RES were bought in one go from NAMA under Project Orange. The largest asset class held by NAMA is development land, and much of this has been sold to global property companies seeking to become long term investors in rental accommodation. For example, NAMA was one of the main owners of 400 acres of suburban land in Cherrywood sold to Texas based Hines. Hines plans to develop up to 3,600 apartments on the site. Secondly, there has been plenty of money washing around the global financial system and seeking to find its way into Irish property. As a PWC report earlier this year put it, European debt markets are ‘awash with capital’. The global financial environment continues to be characterized by some of the core dynamics that drove the financial boom of the 2000s: very low interest rates and low yields in traditional asset classes such as government and corporate bonds. Add to this significant quantitative easing in the US, UK and now the EU. There is a lot of money out there looking for somewhere to go, and heavily discounted real estate looks like a good bet. Hence, much of the money buying up Irish real estate is flowing in from the global financial system. Hines, itself a Texas based company, is backed financially by New York private equity firm King Street Capital. I.RES has funded its property shopping spree through its Canadian backer, the Canadian Apartment Properties Real Estate Investment Trust. Thirdly, and finally, the transformation of the Irish housing system has turned the rental sector into a viable investment for international players. The sector continues to expand rapidly, increasing by over 100% in the Dublin region since 2002, as do rents. Most importantly, however, the collapse of the mortgage market means yesterday’s ‘first time buyers’ are today’s ‘top end renters’. The new class of landlord is chasing the high rents paid by a new class of renter, e.g. two income professional couples who are renting long term. The business strategies of all the new institutional landlords thus work around these three axes: using global sources of capital to buy discounted Irish assets and rent them to relatively well-off renters. Let’s look in a little more detail at just what they’re up to. I.RES (Irish Residential Real Estate Investment Trust) has spent around €400 million in the last year or two acquiring 1,200 apartments in Dublin. They hope to expand their portfolio to around 3,000 apartments. The company claims it “is focused on consolidating the fragmented Irish rental market by targeting high quality property assets … To deliver superior customer service, enhance tenant retention, and deliver quality homes.” They have been widely reported to be seeking rent increases of up to 20% across their portfolio this year. They are also considering expanding into affordable housing, social housing and student residence, all of which are potential new asset classes for global property investment in Ireland. You can read more about their plans in their investment brochure. Oxley Holdings are also pursuing high end renters, but are even more focused on the top of the market. 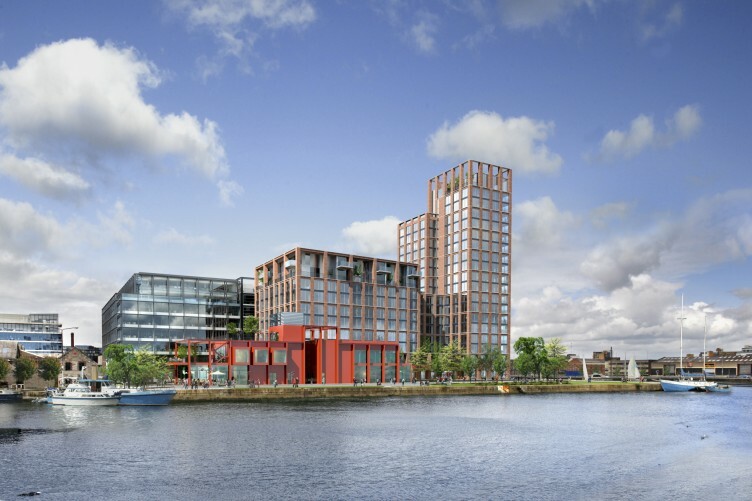 The Singapore based developer describes itself as “a lifestyle property developer that caters to the upwardly mobile homebuyer and entrepreneur” and is building 200 apartments at 72 – 80 North Wall Quay in Dublin’s Docklands, bought from NAMA last year. In two years they have acquired over €1 billion in commercial, retail and residential property. 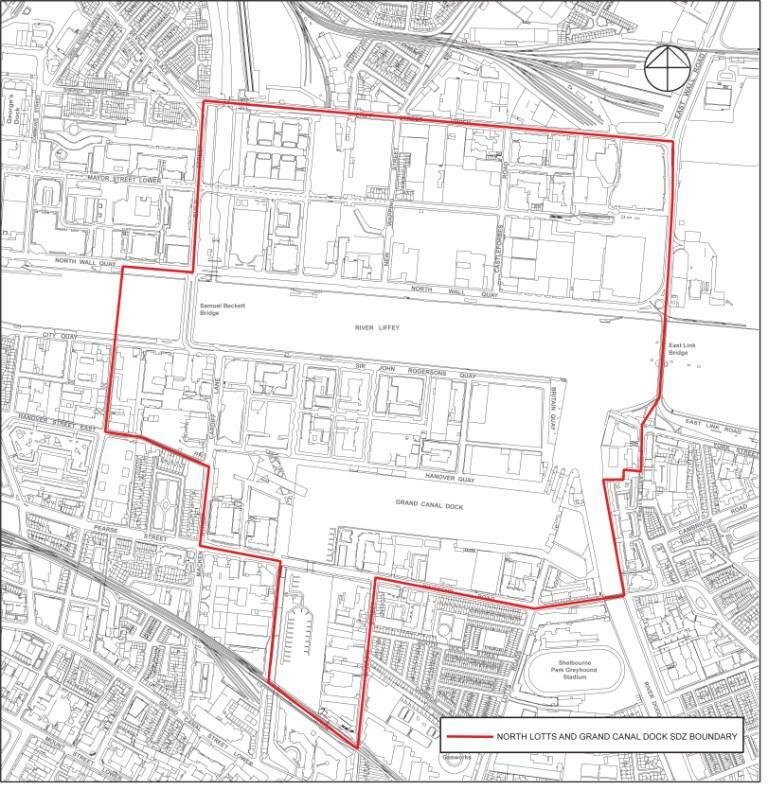 As mentioned they look set to become a huge landlord under the Cherrywood development and are also building apartments in the Docklands, where they are completing the Spencer Dock development in conjunction once again with King Street Capital. Hines also sees themselves as a targeting the high end of the market and providing the high quality rental property. Their developments will also include special facilities and property management. Finally, LA based Kennedy Wilson has aggressively entered Ireland chasing distressed assets but also developing major projects. While they have only a small residential portfolio (mainly investing in offices) they have snapped up around five apartment blocks in Dublin and are building the Clancy Quay complex near Island Bridge. KW have also entered a joint venture with NAMA to develop the Capital Docks project on Sir John Roggerson’s Quay in the Docklands. They submitted planning application in April 2014 for a major development on the 5 acre site. One of the buildings will be a nineteen story tower while overall the development will provide 300,000 sq. ft. of office space and 204 apartments (check out the commercial brochure for more details ). Interestingly, Deutchse Bank issued the first Commercial Mortgage Backed Security backed by Irish rental properties in 2015. The MBS was backed by loans linked to KW’s apartment investments. But what does this all mean for tenants and for housing more generally? While it’s too early to say, international research certainly gives cause for concern. The pioneering work of Desiree Fields has documented the impact of private equity firms on residential rental properties in New York and elsewhere. Issues include high rents, high rates of tenant turnover and other aggressive business strategies which hit tenants hard. In the Irish case, given that institutional landlords are focused on relatively well-off tenants, we might be tempted to think that their impact will be negligible. Given the chronic lack of affordable rental accommodation, however, we should certainly be concerned about the opportunity cost associated with this new form of investment. Every apartment block or development site snapped up by global companies with significant financial fire power is a lost opportunity for affordable housing. From the point of view of the city as a whole, it would have been better to see heavily discounted apartment blocks and cheap development land being bought by local authorities and housing associations. Instead, affordable housing is being crowded out by a few large players whose only interest is in ‘top end’ tenants. Thus, while the possibility of professionalization raised by institutional investors has been welcomed in some quarters, the early indications are that they will do little for the majority of tenants. Mick Byrne is an IRC postdoctoral researcher in NIRSA NUI Maynooth. He is also an activist involved in various housing issues, including the Dublin Tenants Association. THE Central Bank’s proposed mortgage lending regulations — through the introduction of a 20% deposit requirement for borrowers — have drawn criticism from the Government, property market interests, and the ESRI, for its likelihood to restrict the ability of people to get mortgages to buy housing. The ESRI state that “Irish house prices still appear to be undervalued” and that “most commentators have identified a lack of housing supply as the main policy concern in the Irish housing market at present”. Instead, they want to give a different “signal to the market”, ie tell property developers that financial institutions will be allowed give lots of people lots of credit to buy homes, and thus they should start building again. Prices will stabilise, their theory says, and we will have another generation of happy homeowners living the property dream. Of course the reality will be developers and sellers pushing up prices in the knowledge that borrowers will be able to get mortgages at multiples of their incomes and deposits. Doesn’t this seem eerily familiar? Wasn’t the expansion of unsustainable borrowing for home ownership one of the fundamental causes of the crash? Have we learned nothing from the fact that 130,000 households are still in mortgage arrears? If the concern of policymakers and economists is to provide young families and low to middle income earners with high quality, affordable, secure housing in sustainable communities, then clearly this is not the way to do it. There is a need to explore alternative ways of addressing this need rather than creating another housing bubble and unsustainable levels of indebtedness, poverty, and stress. One obvious area that offers great potential is the private rented sector. Many people looking to buy a home are doing so, not because of some insatiable desire to own property, but simply because of the failure of the private rented sector to meet their needs. The private rented sector now accounts for a fifth of all households. In urban centres it is even more significant with almost 40% of people renting in Galway, 35% in Dublin, and 29% in Cork. However, the recent annual report of the national housing charity, Threshold, detailed chronic failings “that need to be addressed before anyone living in a rented dwelling can really consider it their long-term home”. Threshold has found that “loopholes in the law are enabling landlords to remove tenants from their homes and then re-advertise the same properties at substantially higher rents” and they are “increasingly witnessing such economic evictions, where families are forced to leave their homes because of exorbitant rent hikes”. In the absence of any regulation, rents have increased dramatically, in some cases up to 40% in the last four years. The introduction of rent control is imperative to change this and provide a functioning housing system that can meet people’s needs. The youth campaign We’re Not Leaving recently produced a report that pointed out Germany only allows increases in rents for sitting tenants of up to a maximum of 20% over three years, with some cities permitting no more than 15%. The Netherlands has rent control between and within tenancies where the initial rent for a unit is regulated and there is a maximum rent for each dwelling based on a points system awarded according to size, quality, area etc. This shows that the argument that rent control reduces supply is not true. These countries have a much larger provision of rental properties than Ireland. The issue of supply could also be addressed by the use of the 43,707 vacant properties in Dublin (including 16,321 apartments), 6,168 vacant units in Cork City, and 3,755 in Galway City. Refurbishing and rebuilding derelict units or converting the thousands of empty retail and office buildings into suitable accommodation could also help supply. 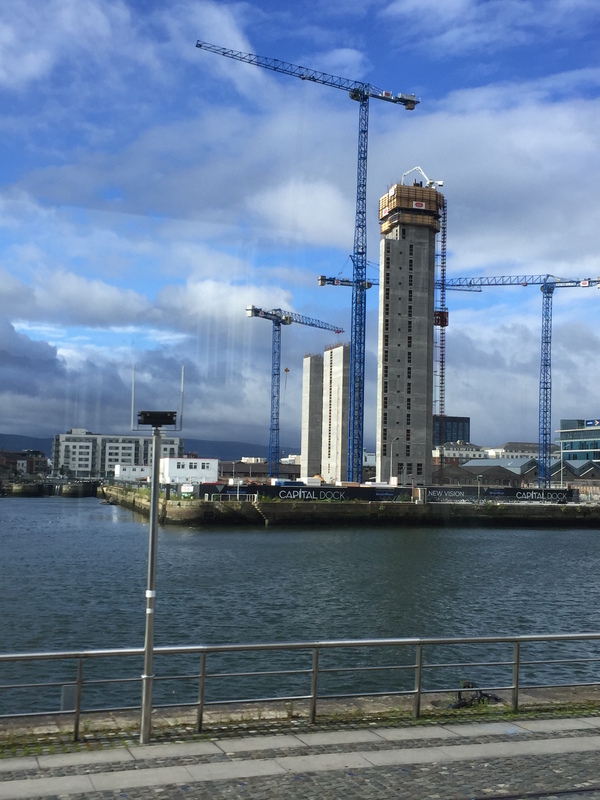 Nama’s €3bn development fund should focus on funding local construction workers to undertake that work and provide low-cost rental accommodation rather than funding the large developers and real-estate investors. Another issue raised by landlords and property economists is that rent control would contravene their private property rights enshrined in the Constitution. It is true that Article 43.2 protects “the right of private ownership”. However, Article 43.2.1 states that this right “ought to be regulated by the principles of social justice” and the State may, “delimit by law” these rights for “the common good”. Essentially, the Constitution protects the right to private property but states that these rights can be superseded by laws and measures (such as rent control) that are in the interests of social justice and the “common good”. An expert on housing and property law, Padraic Kenna of NUI Galway, has detailed how there is no property rights impediment to rent regulation at an Irish and European level. He has pointed out that the European Court of Human Rights has established that rent controls are accepted as a means of state control on the use of property in the general interest. For example, in 2013, the ECHR held in a Dutch case that laws on rent control which imposed caps on rent increases of 2.5%, 1.2%, as well as rent reductions, did not impair landlord’s property rights. So there is nothing stopping the Government from passing regulation to restrict the rate of rent inflation in any one tax year to, for example, 5%, and then recouping a higher rate of tax on rental incomes where a landlord has breached this cap. We need a national debate about who really benefits from the current housing and property market based around homeownership, and spiralling house prices and rents. The big beneficiaries remain the banks, developers, estate agents, solicitors, landlords, and increasingly, international capital and vulture fund investors who are buying up huge swathes of Irish residential property (often from and with Nama). They all have a vested interest in a rising property market. It is unsurprising, therefore, that property commentators, who are generally in some way connected with one of the above interests, argue against rent control. The truth is, rent regulation along with significantly increased security of tenure for tenants, and improved standards, would help to make the private rented sector a realistic long-term housing option. It would also immediately help address the homelessness crisis. Can vacant housing solve the social housing waiting list? There has been some recent talk in the Dail and the media about the extent to which Ireland’s vacant housing stock could solve the social housing waiting list and save the state half-a-billion euros worth of rent supplement payments per annum. To what extent is this wishful thinking? In principle it looks like vacant housing stock should be the answer to the social housing waiting list. There are 98,318 households on the waiting list and 230,056 housing units vacant in the country (excluding holiday homes) according to Census 2011. However, both figures are composed of a variety of types of household and housing units that deny a simple matching up. The 98,318 households on the waiting list are composed of the following categories: 65,643 persons unable to reasonably meet the cost of the accommodation they are occupying; 9,548 persons in need of accommodation for medical or compassionate grounds; 8,534 persons sharing accommodation involuntarily; 4,594 persons living in overcrowded accommodation; 2,348 homeless persons; 2,226 older persons; 1,824 Travellers; 1,708 persons living in accommodation that is unfit or materially unsuitable; 1,315 persons with a disability; and 538 young people living in institutional care or without family accommodation. The 230,056 vacant housing units consist of 18,638 unsold, vacant units on unfinished estates owned by developers or banks, a few thousand unsold, vacant one-off houses, and c.200,000 units in private ownership that consist of units presently for sale or available for rent, empty bereavement properties, vacant investment properties, units where owner is in long-term nursing care or retirement home, or empty due to short-term or long-term migration. In addition, there are another 8,794 nearly complete units and 9,078 under-construction units on unfinished estates. On the one hand then, we have 65,643 people in suitable accommodation which they can’t afford, along with 13,129 people (medical condition, disabled persons, older persons) that need specialist or sheltered accommodation. On the other, we have a stock of vacant units that are universally in private hands (either owned by an individual or a company), are not designed for social or sheltered housing, and are often in places unsuitable for social housing tenants (they lack public transport, social facilities and access to employment). A small proportion of this vacant stock are in unfinished estates and these are owned by developers and banks, only a small proportion of whom are in NAMA (a large number of unfinished estates were funded by foreign-owned banks). The means for the state to presently access this unfinished estate stock is the Social Housing Leasing Initiative. Put simply, vacant stock is privately-owned (even in cases where the loan is with a state bank or NAMA) meaning there are only two options with respect to moving people on the social housing waiting list – move them into other private accommodation reliant on rent supplement or into private accommodation reliant on the social housing leasing initiative. Neither is going to save the state much money as the state does not own the property and does not have any excess stock of its own. Moreover, the latter will leave empty private rental stock in its wake whose buy-to-let mortgages will start to default, placing more pressure on the state-guaranteed banking sector. In other words, vacant stock is not the answer to the social housing waiting list; it’s just moving people around privately owned stock. Ultimately, the only solution to the social housing waiting list is for the state to build or buy social housing units, or to accept that the 65,643 private rental sector units that are presently unaffordable for tenants is de facto social housing stock held in private hands. The only solution to vacancy is household growth, so that supply and demand equalise.